Our patient, a 26-year-old female, initially presented to FTT Skin Clinics with skin issues mainly on her neck area, which we diagnosed as atopic dermatitis caused by an autoimmune problem, so we referred her back to her GP for further investigation. During the in-depth consultation with the patient, however, she divulged that she also suffered from an area of baldness on the crown of her head. The patient has long, glossy, auburn hair and over a period of several months prior to our visit she had noticed a distinct patch of baldness emerging when running her fingers through her hair. We measured this area to be 5x5cm, which she managed to cover up most of the time by brushing her hair over the area. The patient didn’t know who to turn to in order to resolve this issue as she was unsure of the treatment possibilities. 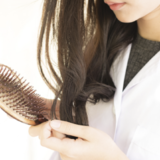 While we explained that we do offer treatment for hair loss, we recommended that she have a routine blood test when she visited her GP to aim to diagnose the cause of the hair loss before we offered any treatment. 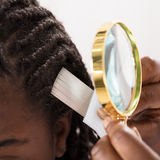 When the patient visited her GP, she discussed additional concerns of non-specific tiredness, describing that she had been feeling run down, was presenting with skin issues (aforementioned atopic dermatitis), as well as her hair loss. The patient’s blood test indicated that she was mildly anaemic with low B12 and was consequently treated by her GP with a course of B12 injections (hydroxycobalamin), which resulted in improvement in her tiredness and fatigue. The GP believed the cause of her hair loss was the B12 deficiency, and a lowered autoimmune system. The patient was also treated with first line emollients and a mild potency topical steroid (hydrocortisone 2%) for her atopic dermatitis. In addition, the GP recommended the patient started using over the counter hair treatment shampoo Nioxin for her thinning hair. The following week, as her hair patch had not resolved, she came back to our clinic for us to assist her with her hair loss concerns. 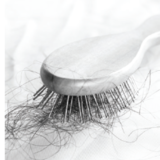 Treatment options for hair loss are variable and are dependent on the type. Many hair loss treatments can produce regrowth of hair, although it has been reported in the British Medical Journal that complete reversal is never achieved.8 For this patient, the options we gave her were that she could either do nothing, as it may resolve on its own, or try over the counter minoxidil 5% shampoo. Although, in practice, we find that this is a variable treatment and is unlikely to completely resolve the issue. We also told her about a treatment that is new to the clinic, cold atmospheric plasma combined with mesotherapy, which we had not used for hair loss before, but thought may help. We have had considerable experience with cold atmospheric plasma for non-surgical lesion removal and acne treatment, however the concept of using cold atmospheric plasma with mesotherapy was relatively new. The patient was attracted to this option because it is a non-invasive treatment with no downtime or pain. After an in-depth consultation, she decided that she would try a six-week course of this combination treatment as her hair loss was causing her great distress. For this treatment, we used the Plasma BT Shower handpiece with RRS XL Hair mesotherapy. We also offer RRS mesotherapy through microneedling, however most of our patients prefer to use it with Plasma BT as we find it to be quicker and more efficient. The treatment is also pain-free as you can treat deep into the dermis using transdermal delivery from the Plasma BT to biorevitalise the skin, without needles. Plasma is the fourth state of matter, following the state of solid, liquid and gas, whereby the gaseous state has been ionised by the high temperature and high electricity in everyday environment. Plasma works differently in bacteria than in a human cell. It kills bacteria, but it provides stimulation to a human cell and helps with its regeneration.9,10 In aesthetics, plasma devices can be useful because they can dramatically increase the skin’s absorption rate by temporarily breaking the cell adhesion molecules (CAMs).11 Because of the change in CAMs, we can get volumes of several millilitres of mesotherapy products into the skin that would have previously had to been injected. This is why I believe it is a good option to use to enhance the effects of mesotherapy hair loss, as injecting superficially into the scalp is particularly painful and difficult to anaesthetise in the usual way with topical creams.9,10 Mesotherapy is a hugely popular treatment, which is traditionally injected into the skin as a solution loaded with amino acids, antioxidants, peptides and hyaluronic acid. RRS is our mesotherapy product of choice as we have found it offers our patients safe, highly effective results for the face and body. There are no contraindications to this treatment, however at FTT Skin Clinics we ask our patients to see their GP before beginning to rule out any underlying issues. As the patient reported being systemically unwell, as well as her atopic dermatitis, we felt it was best to work in conjunction with her GP. We treated the symptoms of her hair loss, whilst he investigated and treated the causes, explained above. We treated the patient with cold atmospheric plasma and mesotherapy every seven to 10 days, as per the patient’s schedule, which we found was long enough to monitor any growth/changes. We performed six treatments and recommended three hair products to enhance the results. We firstly advised the patient use an adequate scalp preparation shampoo two to four hours before each treatment. Other products are available, but we recommended Aesthetic Dermal Daily Care Scalpfit shampoo, which is designed to be used before procedures like mesotherapy or hair transplant. We instructed the patient to leave this product on the hair for two minutes before rinsing off. We also recommended Aesthetic Dermal Hair Energizer spray, which was to be applied to the scalp twice daily and gently massaged to ensure distribution the affected area, as well as Revitalix post-treatment scalp and hair hydration revitalising shampoo, to be used after every treatment and in between treatment sessions as maintenance. The patient had noticeable results from the third session, going from a smooth bald patch on week one, with soft vellus hair on week three. This continued to improve over the following three sessions and, at week six, although the hair was short in this area, there were normal terminal hairs at full hair thickness. We reviewed the patient after a further four weeks, where there was noticeable hair growth and no evidence of any further hair loss. We advised the patient that although the results may be permanent, due to the nature of alopecia areata, this patch may reoccur, not necessarily in the same area. If there was further hair loss in the future, then a full six-week treatment using the same protocol would be advised. Although alopecia is considered a benign disorder and viewed as a cosmetic concern in many patients, it can have a huge psychological impact on the individual’s quality of life. We believe mesotherapy offers a good treatment option for patients suffering from non-scarring alopecia and, in our experience, combining it with cold atmospheric plasma is revolutionary as it can lead to faster and more effective results, without any downtime, and the treatment is completely pain free. Davis, D. S. Callender, V. D. (2018). Review of quality of life studies in women with alopecia. International Journal of Women’s Dermatology. Emmert, S, Brehmer, F et al, Atmospheric pressure plasma in dermatology: Ulcus treatment and much more, Clinical Plasma Medicine, 2012. Lademann, O, Richter H, et al., ‘Drug delivery through the skin barrier enhanced by treatment with tissue-tolerable plasma’, Exp Dermatol. 2011 Jun;20(6):488-90. 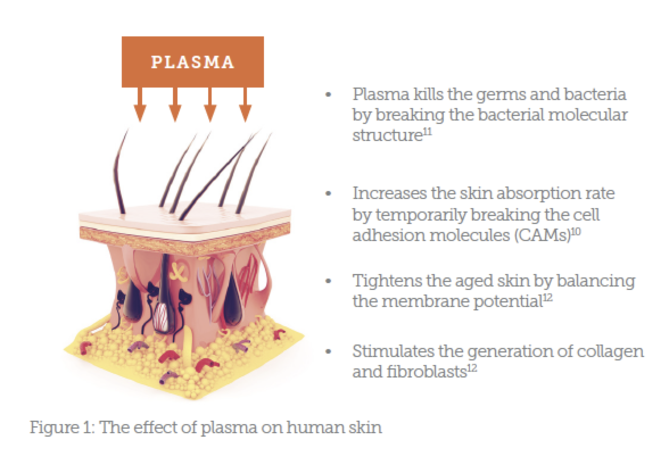 J Heinlin, et al., Plasma applications in medicine with a special focus on dermatology, Journal of the European Academy of Dermatology and Venereology, 2011, 25, 1–11. Choi, JH, et al., ‘Treatment with low-temperature atmospheric pressure plasma enhances cutaneous delivery of epidermal growth factor by regulating E-cadherin-mediated cell junctions’, Arch Dermatol Res. 2014 Sep;306(7):635-43.